Gallery of emotions for attention to female face. Unhappy emotions of a female face can draw attention so effectively as joyful or open emotional expressions, and consequently cosmetic design of facial make-up should not mask sad physiognomic features. Joyful eyes - display of desires. Joyful eyes and eyebrows seem frank as the mouth expresses open emotions. 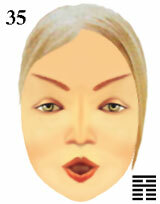 The open mouth seems rousing and affective as eyes and eyebrows express joyful emotions. Rousing eyes and happy ideas express admiration of open feelings. Inspiration of ideas raise desires and are shown in feelings of the person. cosmetic make-up and emotional attention of a female face.